First, we had the industrial revolution, next, we had the Internet revolution and today we are having the digital revolution. Nothing is a better manifestation of this digital revolution than the digital transformation enterprises are undergoing, albeit the magnitude and extent can be different for organizations in varying levels of maturity. The Dataquest Digital Conclave organized in conjunction with the Dataquest Leadership Awards highlighted these varying levels of maturity from organizations who are either in the cusp of achieving this transformation themselves or driving other enterprises to achieve them as catalysts. While digital transformation is a much-hyped buzzword, the conference aimed to capture its different facets through various sessions. How to transform business and society the digital way, helping India Inc. go digital, and devising a digital roadmap for an inclusive India were the building blocks for the day-long discussion culminating in a session where the best practices for fast-tracking a digital India were evaluated. 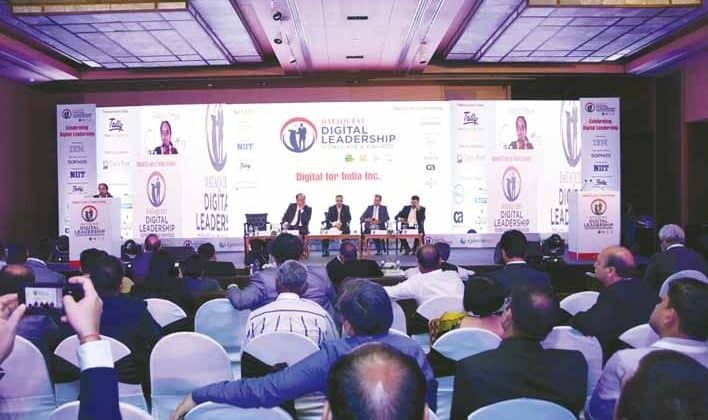 No conference of such magnitude would have been possible without the wholehearted support from the industry and the Dataquest Digital Conclave and the Dataquest Leadership Awards was no exception. IBM, Sophos, NIIT, Tally, Check Point, Dell, NetApp, CA Technologies, Marg ERP and EazyERP were the supporting partners for this flagship program of the Indian tech media industry. An esoteric group of speakers including Nipun Mehrotra, CDO, IBM India; Sanjay Kaul, MD, Global Service Provider Group, Cisco India; Sanjay Kharb, VP-Engineering, Ola Cabs and Prof. Pankaj Jalote, Director, IIIT, Delhi deliberated on the cause and effects of transforming society and business the digital way. Sunil Sharma, MD, Sophos India; Girija Shankar, Head, Business Development, IBM India; Vijay Sethi, CIO, Hero Motorcorp; Vishal Gupta, Head IT, Indraprastha Apollo Hospitals and Rama Vedashree, CEO, Data Security Council of India discussed about efforts and policies and implementations needed to help India Inc go digital. What will be the use if the effects of digital India do not percolate down to the citizens? Sanjay Jaju, Jt. Secy, Dept. of Defence Production, Govt. of India; Raman Roy, Chairman, NASSCOM; Shubhodip Pal, CMO, Micromax and Golok K Simli, CTO, Passport Seva put forward their views on a digital roadmap for an inclusive India. How to fast track this smart and inclusive India was argued and deliberated by Prakash Kumar, CEO, GST Network; PVG Menon, Former President, IESA and Abhay Savargaonkar, Group CTO, Airtel. In sync with the conference theme of recognizing a digital India Inc., more than 20 CIOs from enterprises across the country were felicitated. Similarly, 20 industry awards were presented to technology doyens from IT and communications companies who have been helping in furrowing out and smoothening this road of digital transformation. However, the conference this year coincided with Dataquest 35th anniversary in tech journalism and keeping in tradition with the prestige of India’s oldest and largest tech awards, four luminaries were felicitated at the Leadership Awards. Ashok Soota, Founder, Happiest Minds (Former CEO Wipro Infotech, Founder Mindtree) received the Lifetime Achievement award; Ola founder Bhavish Agarwal was felicitated as the IT Person of the Year; Dr Gulshan Rai, Head—National Cyber Security Cell, PMO and AP Hota, former MD, National Payment Council of India were recognised for their innovative contributions to Indian tech industry and society in general. Dataquest Digital Conclave 2018 Leadership In The Digital Era 0 out of 5 based on 0 ratings. 0 user reviews.